You could also use blockade or roadblock - though those terms don't necessarily convey the temporary and improvised nature of it. Nicaragua has been full of these lately, though their numbers have been going down. I realized that this was the Nicaraguan term for them from this debate about the Nicaraguan resistance and the politics of solidarity with it on Democracy Now. 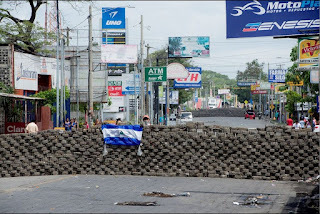 As I've blogged before, in other countries they use terms barricada or bloqueo. In Mexico it is sometimes tope de carretera, and it can be a piquete in Argentina (though that term can also refer to an entire movement). From the photos I found online it seems like Nicaraguan tranques are often made out of cement blocks, which is not as common in other Latin American countries. note: Thanks to Barbara Wood for pointing out over on the facebook version of this site that the cement blocks are paving stones. The same ones used by the Sandinista guerrilla as they fought to overthrow Somoza. If you're on facebook please like my page there to get these posts in your facebook feed.